The Julius Keilwerth company was founded in Graslitz in 1925, when Julius (12.04.1894 – 14.11.1962) started making alto and tenor saxophones. Once these 2 saxophone types were extremely successful, he began making sopranos, baritones, and, upon special order, bass saxes. The early Graslitz horns were named King and Toneking. These horns had split bell keys, and when factoring in finish options, in total, were available in 98 different versions! Finish options ranged from bare brass with no engraving, to multiple dips in gold plate, with full pearl treatment. Note that the company didn’t make any C melody saxophones. J.K. also never made any high pitch horns. All their saxophones were tuned to A=440. Modell L: Most basic model with no pearls or rollers. Modell IV: A simple model with pearls on keys and with rollers. 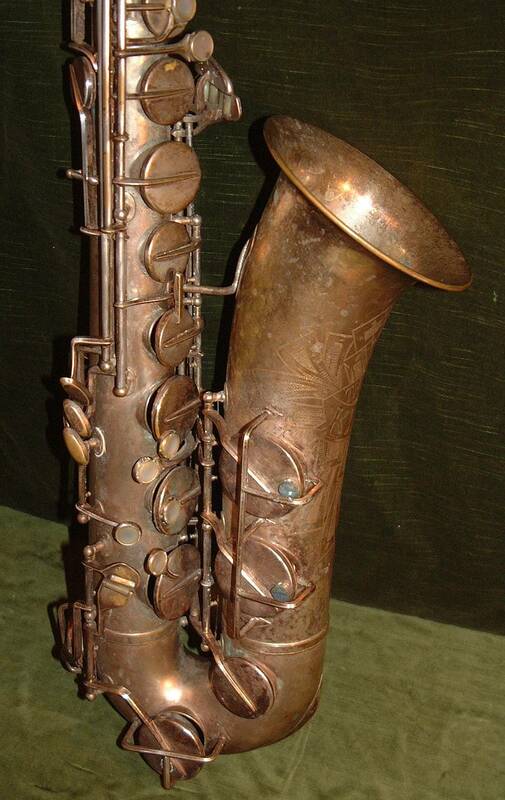 Modell III: The entry level sax with a front F key; drawn & rolled tone holes; microtuner; and pearls on keys. Modell II AKA Amerikanisches Modell: This intermediate level sax had the same features as the Modell III, but had the additional features of a G# trill key and strengthened bow trim. Modell I: This was the pro model that had the same features as the Modell II, but had the additional features of a fork Eb, mother of pearl rollers, and a clothes guard on the left side. Modell Soloist: Like the Modell I, but with extra mother o fpearl key touches. Unlike many of his regional competitors of the time, Julius chose not to build French-style horns. 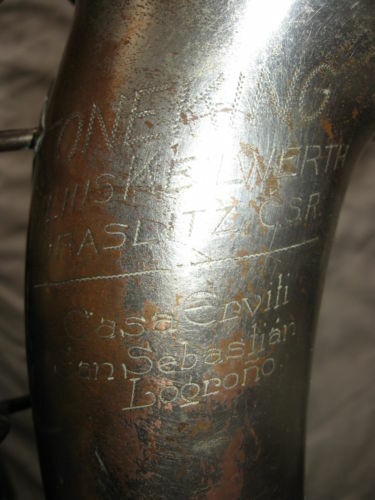 JK horns were instead American-style, with larger bores. As a matter of fact, as noted above, the Modell II of the day, carried the secondary name Amerikanisches Modell (American Model), which is a bit misleading, since all of JK’s horns were, in fact, American models. They only differed in finish and features. Over time, Julius Keilwerth decided to cut back on the number of saxophone offerings, and make improvements to his remaining ones. The most basic models, L and IV, were dropped altogether. The low Bb was moved to the right side of the bell on all models. The bell key guard was at first of a very simple wire cage variety, as exemplified in the following photo. Over time, these key guards evolved into the one-piece variety with felt bumpers, like the ones used today. Bell key guards weren’t the only things that changed during the 1940s for J.K. horns. The Modell III became the King, but lost its microtuner. The Modell II also lost its microtuner, and was now branded The New King. If you wanted a microtuner, you had to get at least a Toneking I, which was what the Modell I was now called. And finally, if you were up for the top of line model, the Solist was now branded the Toneking Solo, and yes, it too had a microtuner. 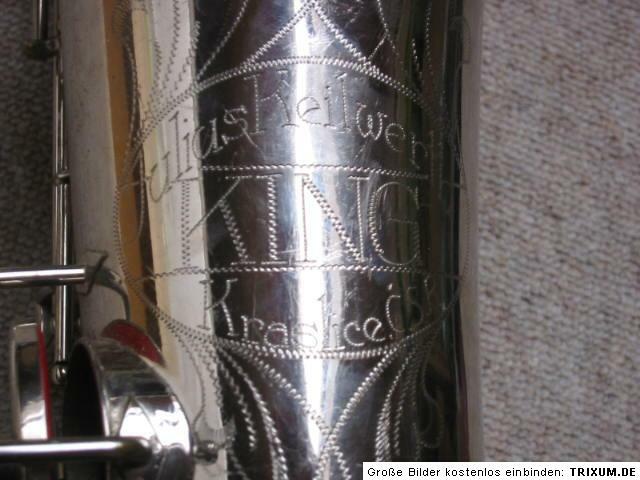 The photos above show a very early The New King tenor, and a Toneking Solo alto. The next photo shows another variation on a Toneking Solo. This one is decked out in almost a full set of pearls. Before May 1945, when Amati was created through a forced merger of all regional competitors, approximately 20,000 saxophones had been built in Graslitz. After the Keilwerth company was taken over in 1945, the family was forced to leave Graslitz. Each person was only allowed to take 50 kg (110 lbs) of luggage on the train with them. Unlike many musical instrument makers, who settled in the Bavarian towns of Bubenreuth, Neustadt/Aisch, Waldkraiburg, and Geretsried, or in Württemberg’s, Winnenden, Julius opted for Nauheim. The next page of the Julius Keilwerth company story will pick up in 1947, when the company started its new business in Nauheim. 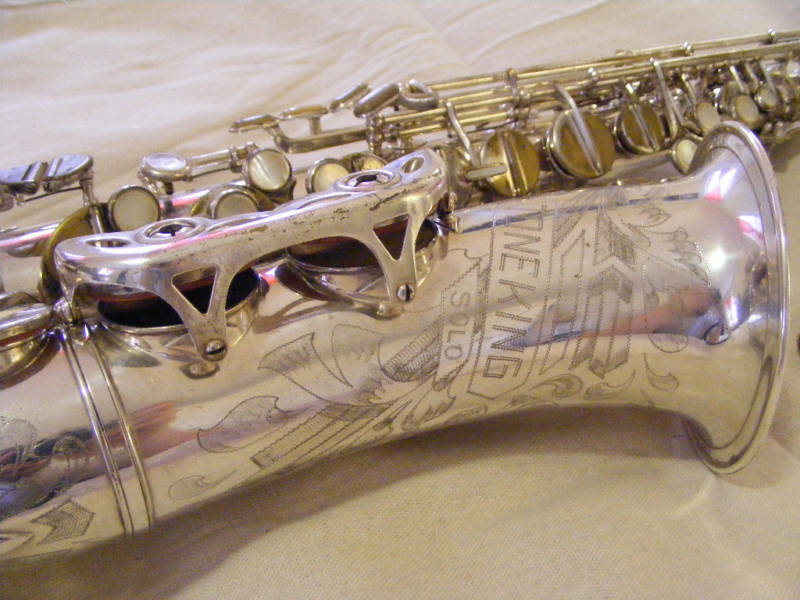 The absolute best serial number chart that I have found for Julius Keilwerth saxophones, is on Saxwelt.de. They recently redid their site, and haven’t redirected their old pages. If you have the old page bookmarked, you’ll want to update it to this one. ¹ The source of information for this page is mainly from Uwe Ladwig, in der deutschen Fachzeitschrift—German music journal—SONIC sax & brass. 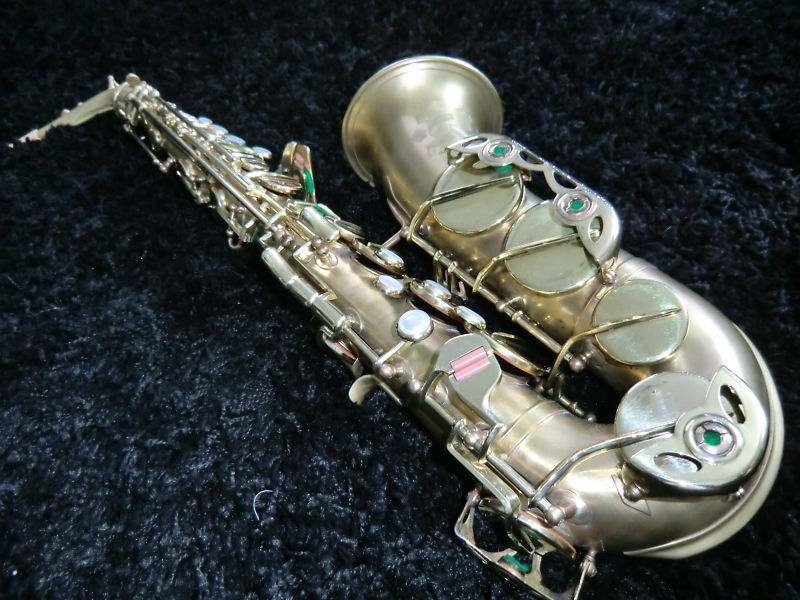 *It should be noted that not every sax (soprano, alto, tenor, bari, or bass) had all the features listed for each model—or for that matter, was available in each model. For example, sopranos didn’t have a front F key, and bass saxophones were only available in either Modell I or Modell Soloist versions.